Microgravity, or weightlessness, exists inside an orbiting spacecraft because its contents (including any astronauts) are falling around Earth—we call this "free fall''—at the same speed as the spacecraft itself (and not, as is often believed, because there is no gravity in space). It is like being inside a falling elevator, but without the hard landing at the end. Astronauts inside the International Space Station (ISS) can simply float through its many modules, have dinner on a wall, and sleep on the ceiling. Because of the microgravity, there is no gravity-defined up or down. This is fun for the astronauts, but the main use for space stations is that the microgravity conditions allow many kinds of experiments that are not possible on Earth. It is like turning off gravity. Fluids that float one on top of another on Earth can suddenly be mixed, as there is no gravity-induced separation based on differences in density. Larger and purer crystals can be grown, and the importance of gravity for the growth of cells and microbes can be studied. We can even do combustion experiments that are not possible on the ground. A candle burning in space does not show the familiar elongated shape of the flame, but instead is spherical and almost transparent blue. The spherical shape is caused by the lack of convection, that is, heated air moving up, because that depends on gravity. There is no "up" for the hot air to go to, so it just stays hanging around the flame. The combustion in the hot bubble is very efficient because partly burned particles are not rapidly transported away by rising hot gases, but instead remain near the heat so they can burn up completely. Microgravity allows us to study combustion processes in great detail, which teaches us how to optimize combustion, for example, in car engines on Earth, and thereby reduce pollution. However, if we want to fly people to Mars, microgravity is not so great. Astronauts' bodies get upset by the lack of gravity. Blood normally pulled down into the legs now tends to move upward to the head, muscles are used much less and therefore deteriorate, and the body notices it do not need to maintain a strong skeleton anymore so it allows bones to weaken (leading to a loss of bone mass). Even though astronauts onboard the ISS typically exercise 2 hours a day to mitigate muscle atrophy, their strength inevitably weakens, especially in the legs. After half a year on the station, it may take an astronaut months to gain back his normal strength. As a result, healthy space explorers who land on Mars after a flight of half a year may not even be able to walk anymore, despite the much lower gravity on the red planet. The centrifugal force that can be used to keep tethered satellite clusters together can also be employed to generate artificial gravity. Fill a bucket with water and swirl it around at the end of a length of rope. If you do it fast enough, the water will not spill out. It is as if the liquid is pulled toward the now vertical bottom of the bucket. Another analogy is riding through a loop in a roller coaster without falling out. Even while upside down you are being pushed into your seat by the artificial gravity generated by the train's velocity in combination with the curved track. In a similar way, putting crewed modules at the end of long beams and having the spacecraft rotate can generate artificial gravity for astronauts. That enables them to live more normally and prevents them from being affected by the harmful physiological changes resulting from exposure to microgravity. In principle, we can attach such modules to each other with heavy structures and thus create a spinning wheel, with people living on the inner rim. 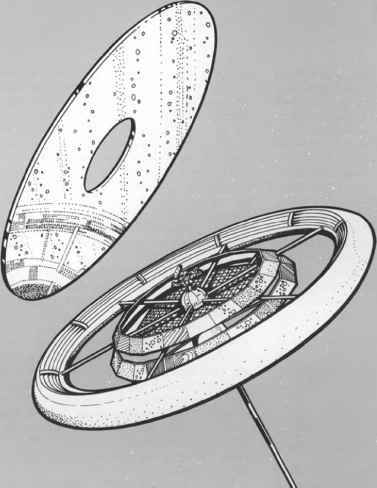 This is the idea behind classical designs for wheel-shaped space stations such as seen in the movie 2001: A Space Odyssey and in many conceptual studies for space colonies (Fig. 1.9). The level of artificial gravity in such a system is determined by the length of the beams between the modules, the spacecraft center of rotation (i.e., the center of mass), and the rotational speed. The gravity level can be raised by lengthening the beams as well as by increasing the rotational speed. We can easily check this out with the earlier described bucket of water on a rope. The artificial gravity increases linearly with the length of the beam/rope and with the square of the number of rotations per minute. Thus, a double beam length (i.e., radius) gives a doubling of the "gravity'' level if the number of rotations per minute is kept the same, but doubling the rotational speed increases it by four. rotations can be very uncomfortable. 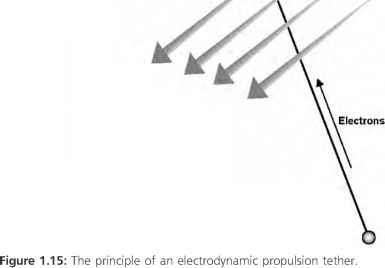 Anything moving in a rotating system experiences sudden accelerations in directions perpendicular to the axis of rotation. In other words, when you move your head away from or toward the center of a merry-go-round, you will feel as if you are speeding up or slowing down. The result is motion sickness. People can adapt to a maximum of six rotations per minute, but the number of rotations for comfortable living seems to be about two. Figure 1.10: The generation of gravity similar to that on the surface of Earth or Mars requires a large radius in order to limit the rotation rate. spacecraft spin so fast that everybody gets sick requires beams that are several hundred meters long. Earth surface gravity simulation at two rotations per minute means a radius of 220 meters (720 feet), that is, a combined beam length or rotational diameter of 440 meters (1440 feet). 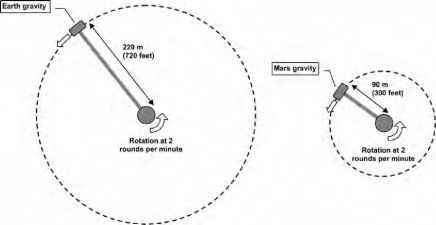 Mars surface gravity is 62 percent lower, but at two rotations per minute still requires beams that are 90 meters (300 feet) long (Fig. 1.10). That means fairly heavy beams. Furthermore, because such long structures do not fit into a rocket, they would need to be launched in pieces and assembled in space. However, since these beams experience only tension forces, they could be replaced by tethers. These are much lighter and thinner, and can be rolled up for launch so that no assembly in orbit is required. On a mission to Mars, the astronauts can deploy the system once they have entered the right transfer orbit, and wind up the tether when arriving at Mars to simplify both spacecraft maneuvering and the astronauts' moving from the habitation modules to the rest of the ship.